All the topping of a pepperoni bacon pizza: tomato sauce, mozzarella, smoky bacon and giant pepperoni. Rolled up and baked like a cinnamon roll. Pizza is my favorite food ever and its the perfect food. I can eat it for every meal of the day, I probably have eaten for every meal of the day. Why not? It has everything in it that you need, it has vegetables, dairy, protein, wheat so it has to be a health food. Right? These little rolls has everything that a slice a pizza will have but less messy and rolled like a cinnamon roll. Have these for lunch or dinner with a bowl of soup or just dip in marina sauce. What is your favorite topping for pizza? Let me know in the comments. 1. In a large bowl, combine water, sugar or honey, yeast, sea salt, olive oil and eggs. 2. Slowly add in flour a cup at a time until well combined. Lightly kneed dough in the bowl for 2 minutes. 3. Form dough into a smooth ball. Cover with clingwrap and let proof in a warm place for 2 hour, it should double in size. 4. Lightly grease two 9 inch springform pan or casserole dish. Set to the side. Flour a clean surface then roll out to 10 x 16 inch rectangle and 1/2 inch thick. 5. Spread pizza sauce evenly, leaving at least 1 inch border. Sprinkle mozzarella and 1/2 of the parmesan then top with pepperoni and cooled bacon. 6. Roll dough into a log, start rolling in the middle then roll the sides. Pinch the seam close then roll in the cornmeal. Cut into 12 1 inch pieces and place into prepared dish. 7. Cover and let proof 1 1/2 to 2 hours, it should double in size or you proof in the fridge overnight. If so take dish out about 30 minutes before baking. 8. Preheat oven to 350 degrees. Sprinkle remaining parmesan cheese and Italian Seasoning blend on top. Bake for 20 to 25 minutes or until golden brown. Let cool for 5 minutes before serving. I love pizza, what a fab recipe! Oh my kids would LOVE this! What a creative way to serve up pizza! This looks amazing! We love pizza and this would be a great dinner option. And now I'm hungry, lol. That looks delicious! I always crave pizza and I haven’t been able to have it in a long time. This definitely looks like an easy recipe to follow! Oh my, this recipe sounds absolutely delicious! I think I know what I will be making when I get home from work! Thank you! Oh my god. I swear if I wasn't a fitness person I'd be super fat. This looks amazing! You had me at pizza rolls, but the addition of bacon pretty much made me a life long fan. Great recipe. You have no idea just how bad I want to eat this whole thing. Yum. Oh my gosh! This is my ideal comfort food! Will need to try it! Wow! This one's a winner. You had me at healthy and delicious!. I would love to try making this recipe. This is my kind of weekend treat. The shape of the pizza doenst look like the usual one I have here but Pepperoni & Bacon are my favorite!! I hope to use your tips and make one pizza rolls myself. These look delicious, my family would go crazy for them! I'll definitely be adding this to our list of things to try. Yum! I am a HUGE fan of pizza and seeing this made me so happy. Thanks for sharing this delicious recipe. I am going to make some! I know a lot of people that would looove this recipe. It's perfect for a party! These look so good! Awesome party food or a naughty weekend treat. Definitely going to be trying them out soon! This sounds like a lovely recipe, as a veggie I would swap the meat out and still be able to enjoy this! THIS LOOKS ABSOLUTELY HEAVENLY. I can imagine myself tasting the deliciousness of that pepperoni!! Yum! I'll definitely be making this for pixxa night one of these nights! Those are making my mouth water! I pinned this for later. I think my son would be extremely happy to find these in his lunch. We're both so over sandwiches. These look delish! Wow this looks so savory and delicious! that mummy bread sounds good as well! Awesome recipe like always. Pizza is my kid's favorite but haven't tried pizza rolls before. This looks so good I'm going to make this for my family. I like hawaiian pizza with anchovies but my kid likes it with pepperoni and cheese. Now this looks absolutely mouth-watering delicious. NICE...These look super duper yummy. I definitely want to try making this!!! My daughter would love this! It looks super easy to make and would be great for a party. This look amazing! I am so making these next! Lovely perfection who does not love pepperoni and cheese. And then made in a dough rolls this is delightful yummy! these sound so savory and delish! I’m all about pizza too! I love this twist and it’s great for company too! Yum! 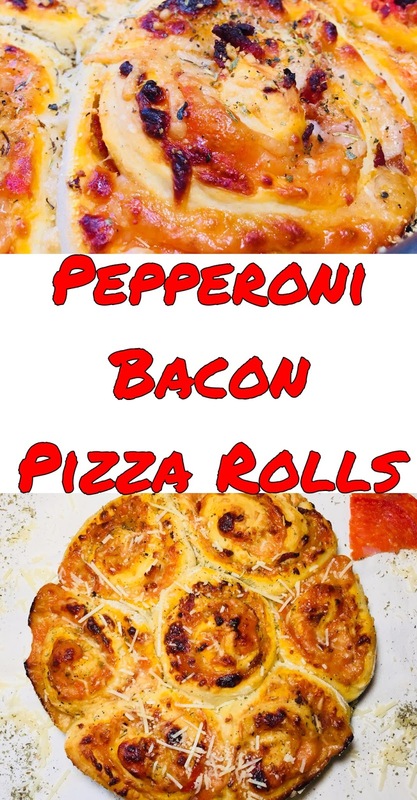 This Pepperoni Bacon Pizza Rolls looks really delicious. I will definitely try to make this recipe. Yummy!!! This sounds so delicious! Perfect for a night in. Another winning recipe in my household!! I could snack on this right now! This recipe look slike something my family would enjoy! They love anything to do with pepperoni, bacon, and pizza, haha. These look AMAZING! Pinning to make as soon as I can go grab the ingredients! I typically don't put any bacon on my pizza, but this actually looks quite appetizing! YUM - you did it again. Thank you for the recipe. My kids will love these! Those look delicious! Love pizza & bacon! Omg, I need these in my life. Unfortunately I'm just started eating healthy again so can't have them right now! Very inviting. Nice pictures. Thank you for the recipe. I would definitely give it a try. Perfect treat for anyday! I'd probably add more spice or some jalapeno (maybe not) but this easy delicious recipe is just my thing! OOh...yummy. I'll have to try this! These look like they would be great to take to a party. Bacon makes everything better, but seriously....these look AMAY-ZING! Oh my gosh these look fantastic! How can you go wrong with pizza AND bacon! Will be trying these VERY soon. will actually give this a try tomoro! fridays are pizza day! I may have to try these... I am absolutely in agreement with you, Pizza is my favorite food too, and I probably have eaten it for 3 meals in a day! I love hawaian pizza and thats because of the pineapple toppings and the ham and cheese. I think it would be better to try that one too here. I love pizza! The crust on this looks so appetizing. I like crispy crust so I would eat all the outside pieces, lol. These look like something I've had in West Virginia. Sooooo good! I've pinned this and shared in so many places because I feel like people need to know about this recipe. I seriously can't get over how delicious it looks!! Those look so tasty... I can’t wait to give them a try!! Yum! Not a huge pizza fan but this I would love to have a taste. Great post! This sounds and looks so delicious. My family love pizza and pizza is always a great dinner option. I will try this out. I think I know what I’m making for dinner tonight. These look so good! I like that you included the recipe for the dough, most of these kind of recipes just say to use ready made. I can’t wait to try them out! This looks delicious! I'd love to try it with our girls. They LOVE pizza! omg. Yum. I need to make this. Wow, this looks so delicious. Wow! This pizza rolls looks so delicious. My family and i loves all kinds of pizza. They will definitely love this. Oh my gosh, this is genius! This would be a yummy and not very messy party recipe. It looks sooo pretty! I bet it's very fun to eat. I find it a great treat to eat with friends! My husband would love these! This is exactly what he orders on his pizza - pepperoni and bacon. I’ll have to make this for him! I love pizza but baking it like a cinnamon roll makes it more fun to eat! These sound amazing!! We do pizza and movie night every Friday, almost always it is homemade pizza. It is our family fun day. We will most definitely have to give these a try!! If there ever were four words that belong together more than pepperoni bacon pizza rolls, idk what i would do. This looks amazing and so easy to make.